Come Hike & Build You will have a great time building Habitat Homes and an incredible experience in God’s awesome playground! We are located in rural southern Colorado in the center of the San Luis Valley, the world’s largest alpine valley. A population of 40,000 is disbursed throughout our Valley, roughly the size of Connecticut, nestled amidst the 14,000 foot peaks of the San Juan and Sangre de Cristo Mountains. Alamosa is the largest town in the Valley with a population of 10,000; 2,000 make up the campus of Adams State University. With over 320 days of sunshine year-round, we build passive solar design homes. Because of the growing interest in workgroups, we suggest scheduling your workweek well in advance – our calendars book up early! Workgroup Fees We work in an area of extreme poverty, covering a geographic area of 8,000 square miles. Locally, our fundraising potential is limited to a total population of 40,000 people, more than 50% of whom fall below the federal poverty guidelines. For that reason we seek workgroups that can contribute funds to help purchase construction materials. Our affiliate asks for a materials & housing fee of $235 per volunteer per week. These materials will be purchased for your group to be used during your workweek. When sending in your group application, we ask for a non-refundable deposit which goes towards your group’s total materials & housing fee. Housing is available at a local church with full kitchens, showers, sleeping and fellowship area. A portion of your materials & housing fee is given to the church to help cover utility and upkeep costs. Workdays are Monday–Friday approximately 9am–4pm with a lunch break. Wednesday is your rest day to explore the surrounding mountains, take raft trip down the Arkansas or go skiing in winter. The specific tasks for your group will depend on our current construction stage and abilities and interests of your group. Work hours are flexible to give your group time to explore the natural beauty of the Valley. We truly appreciate all the workgroups who build with us. You are our major source of construction funding as well as volunteer labor. In one week, we are able to lay adobe walls, put roof trusses and roofing, build all the interior walls, or drywall an entire home. You make it all happen! 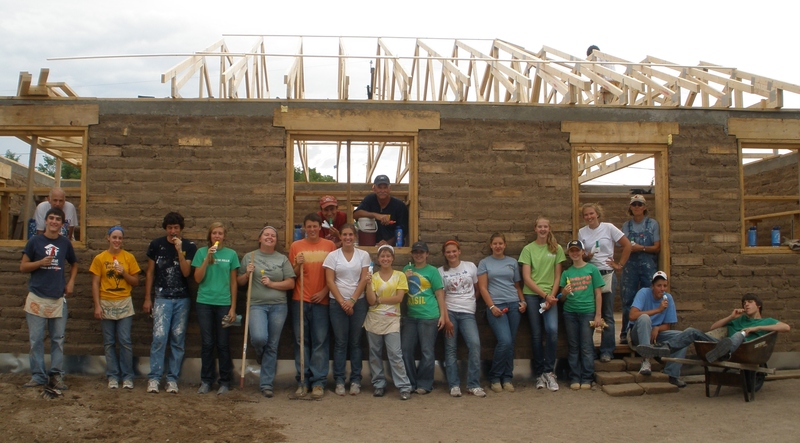 Email audrey@slvhabitat.org if you are interested in organizing a mission trip with us.